Firstly, download Ubuntu Server 16.04 from the Ubuntu website – You’ll need to get this installed yourself, there’s thousands of guides on the internet if you’re struggling. Once your server is accessible, i’d recommend that you SSH to it, although you could perform this though a console. And update any out of date packages. Review the packages that require updating, and then then type ‘yes’ on your keyboard when prompted if happy. You’ll be prompted to create a password for the MySQL root user – please make a password and remember it! Now we start getting to the fun part, actually configuring and compiling Zabbix. I’ve configured it with everything but ssh and jabber, you may remove parts such as –with-openipmi if you’re not wishing to use IPMI monitoring. This should only take a few moments, and you’ll be presented with the final configuration – check over this to ensure it has everything you need and then we can start compiling. This only took a minute or so on my small virtual machine I tested with, but could be slightly slower or faster depending on the specification of the server. This will prompt for the MySQL root password that we set earlier. 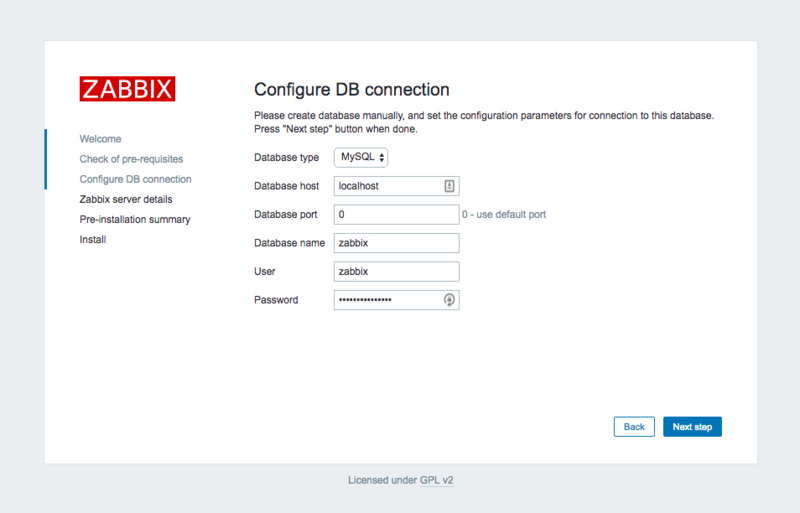 Now we’ll run the SQL to create the Zabbix user and database and assign that user privileges to access that database. Please change PASSWORD to your own password, this can be something completely random as you’ll only need it once to configure Zabbix. After each line, you should get returned something like ‘Query OK, 0 rows affected (0.00 sec)’ or ‘Query OK, 1 row affected (0.00 sec)’ printed to the screen. Now we’ll import the Zabbix schema. You’ll be prompted to enter the MySQL root password 3 times here. If everything is OK there will be no other messages printed. 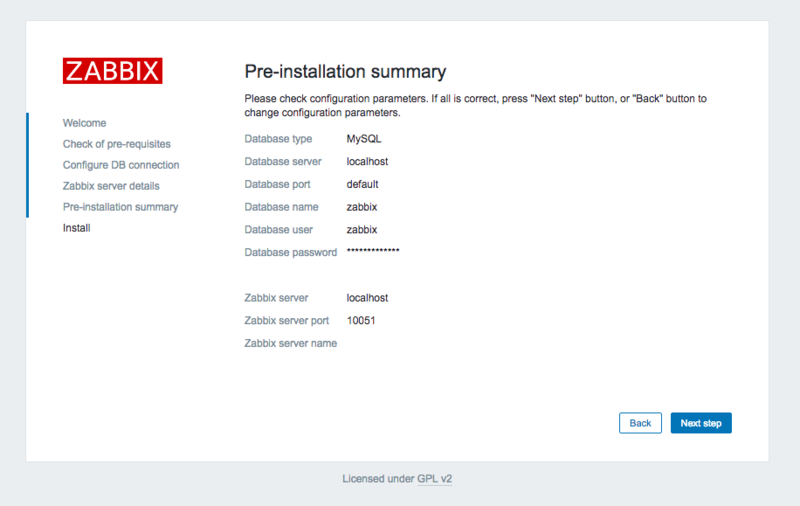 Now we’ll configure the MySQL password in the zabbix-server configuration file. Open /usr/local/etc/zabbix_server.conf in your text editor. Now we’ll add a user for Zabbix to run as. We’ll configure scripts to control the zabbix server daemon. That completes the configuration needed for zabbix-server, we’ll move onto the Web interface now. Firstly, install NGINX, PHP and various PHP modules that we’ll need to run the web interface. Now we’ll need to make a directory for the files to be served from and copy the front end files to it. Now save this file. Next we’ll be changing some options in the PHP config. Open /etc/php/7.0/fpm/php.ini with your text editor. See a list of possible timezones here. Save and exit the file, and restart NGINX and PHP FPM. Click the ‘Next Step’ button and you will be presented with a ‘Check of pre-requisites’ page. Scrolling down the list these should all have ‘OK’ next to them. On the next page, you’ll just need to enter the password for the zabbix user in MySQL. If everything is Ok, the next page will look like this. You can optionally give your server a name. 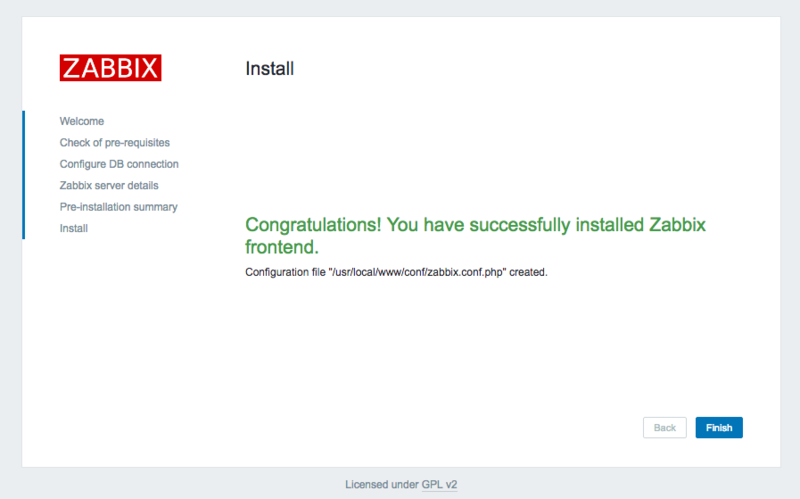 You’ve now successfully installed Zabbix and it’s web interface! 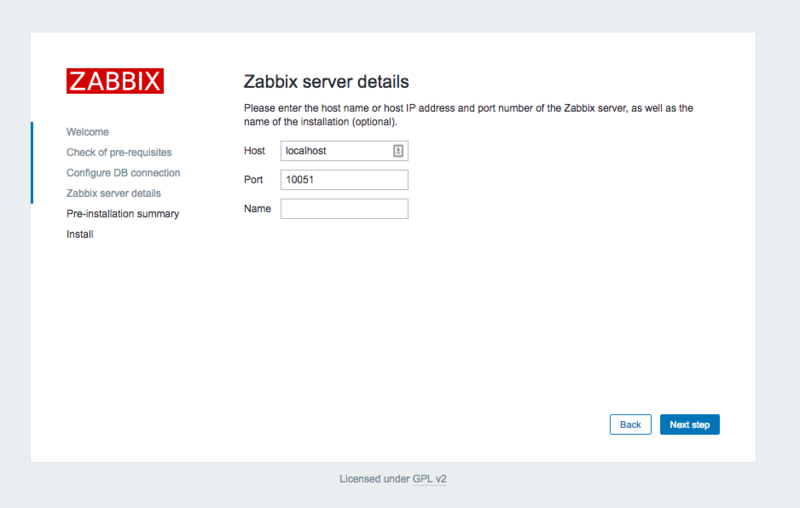 Clicking finish will take you to the login page, the default user is admin and the password is zabbix. You should see on the dashboard that the Zabbix server is running. 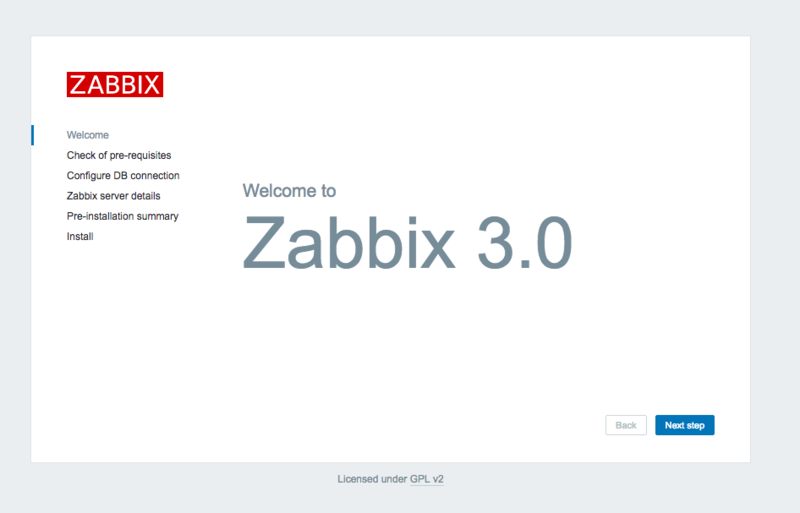 This means all is OK – you can now start configuring Zabbix. If you have any problems or questions, please leave a comment below. Twilio is a great service which is aimed at developers who want to integrate phone calls and text messaging into their application with ease. It can also be used to create phone systems, with which you can control and route calls dynamically using XML files (known as TwiML). If you want to terminate your calls to IP Phones, Twilio can direct calls to SIP. In order for this to work, you’ll need Asterisk or some asterisk-based distribution. Twilio have many gateways which calls may originate from, 7 of them are currently in use, 16 of them are not. Sadly means that we need to create 7 peers (minimum) in order to receive calls from all gateways, however asterisk makes it simpler. The following code needs to be entered into your sip.conf, please set the secret to something of your own choice. I have added the IPs for the gateways that are not yet in use – whilst this isn’t needed, it’s recommended. Now, you need to enter some lines into your extensions.conf in order to tell the incoming calls where to go. I have used the context incoming, but you can use whatever you want but remember to change all references to it. You will see I have used ‘441234567890’ as the extension, this can be anything but using the actual number is useful. I have my calls going to a Cisco IP Phone that uses the Skinny Protocol, however, if you were using SIP you could use Dial(SIP/100). If you have multiple numbers that you want to be terminated to SIP but want them to be dealt with differently in asterisk make sure you use different extensions. Now for the TwiML to connect calls. Make sure the username and password are the same as what you have set in sip.conf, and you’ll need to change the SIP URI to include your extension and IP address. You should now be able to receive incoming calls to asterisk from Twilio. Please leave a comment if you are having any problems and I’ll try my best to assist.